Last modified on April 12th, 2018. 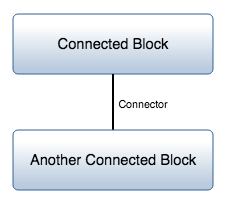 This construct is used to specify the location where 'Block' constructs connect. In the system model, a 'Port' entity is generated to represent a 'Port' construct with the decomposes/decomposed by relationship to a block entity within or above a current level of composition. In the system model, a Connector entity is generated to represent a 'Connector' construct with a connects to relationship to each of the entities which represent the two connected constructs. This construct is used to specify the location where ‘Block’ constructs connect. In the system model, a ‘Port’ entity is generated to represent a ‘Port’ construct with the decomposes/decomposed by relationship to a block entity within or above a current level of composition. In the system model, a Connector entity is generated to represent a ‘Connector’ construct with a connects to relationship to each of the entities which represent the two connected constructs.